Had enough of the heat? 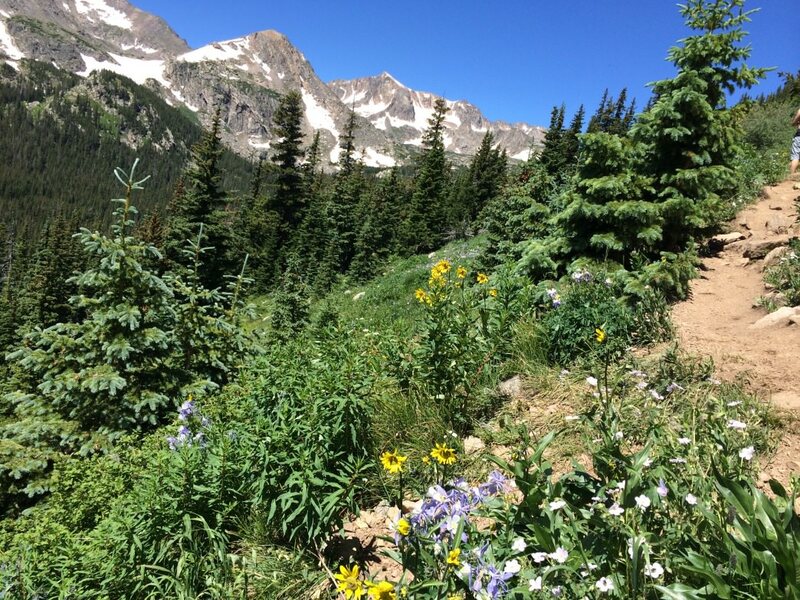 The mercury is pushing 90°, making summer hiking in Colorado a potentially sweltering proposition, especially in the hills of the Front Range. 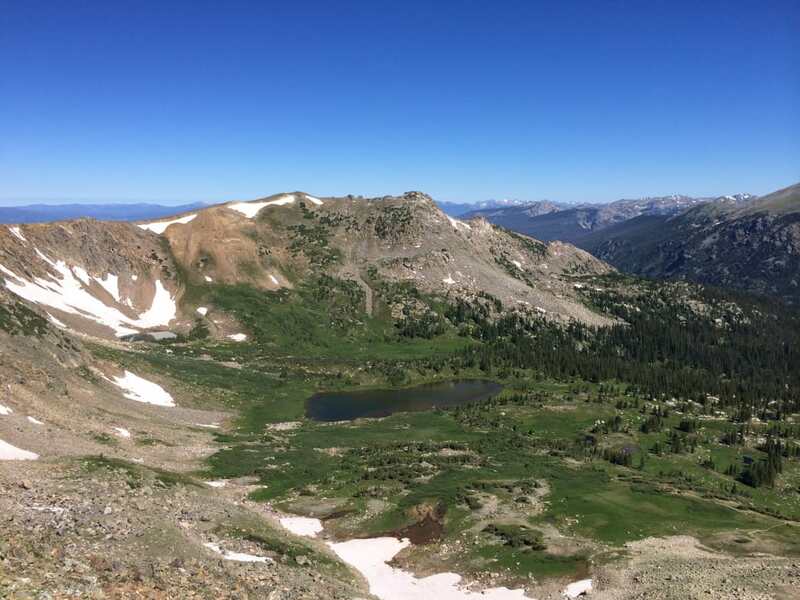 To avoid having to sponge the salty sweat from your forehead at every turn, head for the high country, which is often 20 degrees cooler than the flats. Here, our picks for Colorado summer hikes near Denver and Boulder that will help you keep your cool. Choose from mountain passes, alpine lakes, mist-making waterfalls, and stunning state parks. If you opt for anything above treeline, plan an early start to get off high points before afternoon thunderstorms strike. 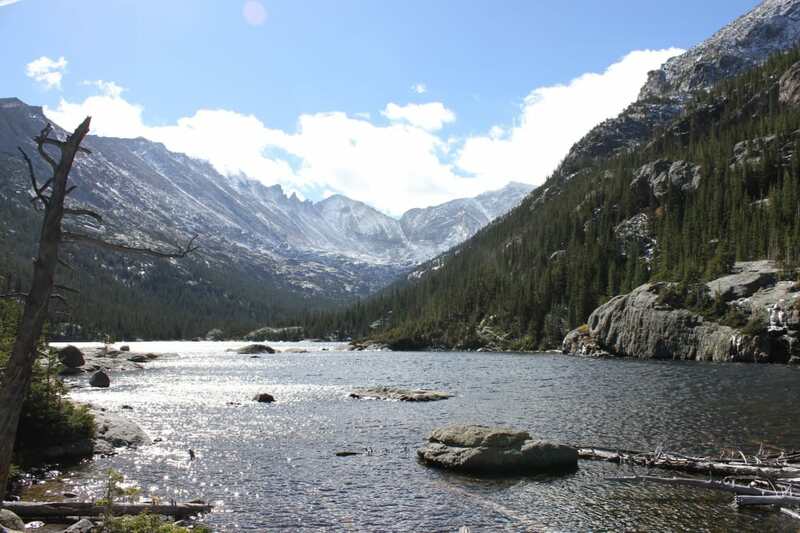 The trek up to Arapaho Pass and Lake Dorothy will quench your thirst for mountains without requiring hours of driving. The trail ascends quickly from the Fourth of July trailhead at 10,172 feet, starting in shady forest and climbing past bloom-covered hillsides with views of snowy peaks. Follow the signs for Arapaho Pass, which tops out after about 3.5 miles on the Continental Divide at 11,906 feet. From here, it’s just a short jaunt on an unmarked trail to the west to reach Lake Dorothy, an idyllic alpine pool in the shadow of crags. Because Indian Peaks Wilderness is so close to Boulder, you can expect company on the trail. Start early to get ahead of the pack. To access the Fourth of July Trailhead, head south from Nederland on CO 119, then turn right on County Road 130. Follow this through the town of Eldora, where the pavement ends, and continue for another four miles on the dirt road until you reach the trailhead. The eight-mile round-trip hike to Pawnee Pass starts from Brainard Lake at 10,345 feet and passes peaceful alpine lakes before climbing steeply through rugged alpine tundra to 12,550 feet. Follow the Pawnee Pass Trail, which reaches Long Lake after just ¼ mile. Drink in the views but don’t linger, as more spectacular sights await. From here you’ll climb through meadows and forests before emerging at Lake Isabelle. You might choose to rest here for a spell before huffing up the switchbacks to Pawnee Pass, where you can peer west over the Continental Divide. If you want to toss in a peak, head north up the ridge for another ½ mile to reach the summit of 12,943-foot Pawnee Peak. Start from the Long Lake Trailhead at Brainard Lake Recreation Area, accessed off Highway 72 near Ward. It’s $10 to park. This is a popular spot, so plan an early start to beat the crowds. Staunton State Park is a hidden gem, just 40 miles southwest of Denver at a cooler elevation of 8,100-10,000 feet. This 4,000-acre park welcomes with its wilderness feel, a medley of granite cliffs, rocky outcrops, rolling meadows, alpine forests, and rushing creeks. The 11-mile round trip hike to the Elk Falls Overlook is well worth the effort, with beautiful views of Chimney Rock, the North Elk Creek Valley, and the spectacular 100-foot falls. If you’re not up for an all-day excursion, the Marmot Passage Trail is another excellent choice, with equally good views to boot. To get to the park, take U.S. Highway 285 south to Shaffers Crossing, 6 miles west of Conifer, then turn north on Elk Creek Road. There is a $7 per vehicle fee to enter the park. To get to the falls overlook, follow the Staunton Ranch Trail to Bugling Elk to Lion’s Back. 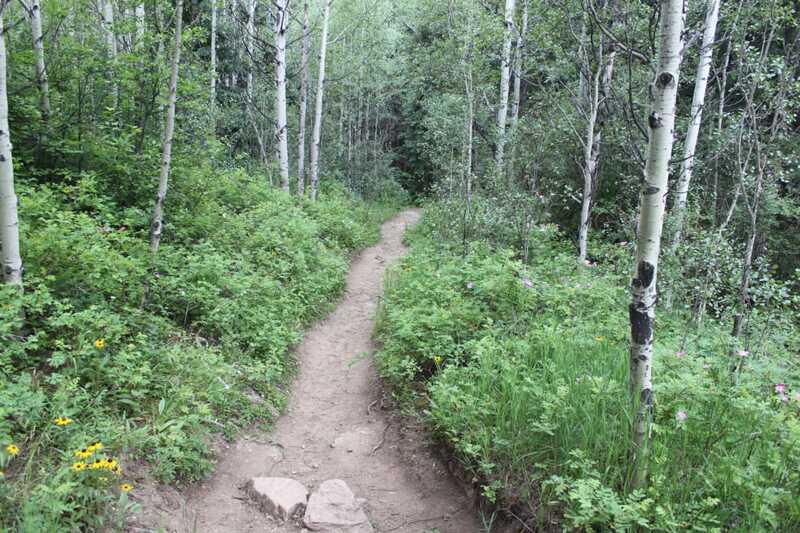 The Horseshoe Trail at Golden Gate Canyon State Park is a leafy treat alongside several creeks, offering a shady break from the heat. It follows a gradual incline—climbing 910 feet over 1.8 miles—and passes through aspen groves and open meadows, with abundant wildflowers, including columbine, Indian paintbrush, chiming bells, and Rocky Mountain penstemon, among other colorful blooms. When you reach the junction with the Mule Deer Trail, either retrace your steps, or continue north on the Mule Deer Trail for less than half a mile to sneak a peek of the Frazer Meadow Barn, an historic structure built in the 1880s when John Frazer homesteaded the property. Golden Gate Canyon State Park is less than 30 miles from downtown Denver. To get to the trailhead, take Golden Gate Canyon Road off Highway 93 in Golden. After 13 miles, you’ll reach the park visitor center. Take a right and continue to the Horseshoe Trailhead. A daily parks pass is $7. 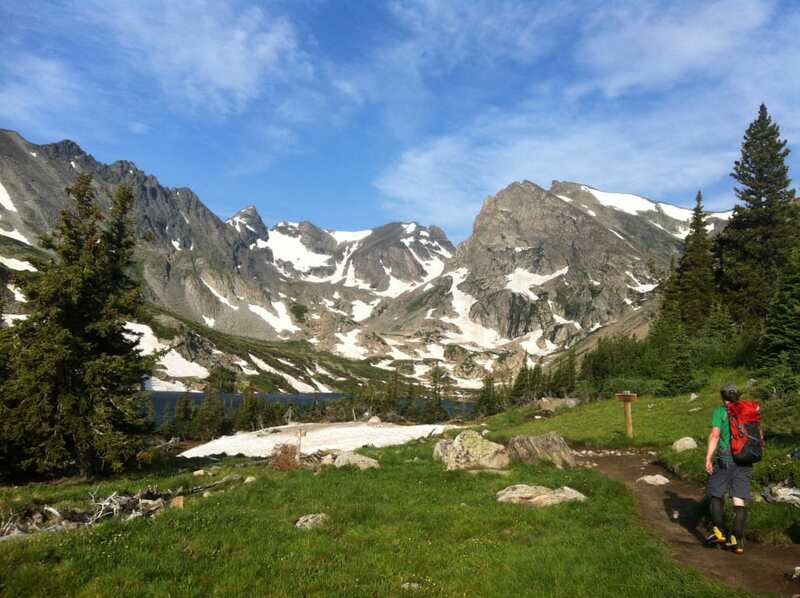 Mills Lake will make your eyes pop and your jaw drop, just what you’d expect of a subalpine gem named for Enos Mills, the father of Rocky Mountain National Park . In a compact 5.6-mile round trip, this hike dishes up the crème de la crème of this iconic park—a rushing waterfall, breathtaking mountain vistas, gushing creeks, and marshy wildflower meadows. The picture-perfect lake is a sight to behold, with forested hillsides and rocky ledges that spill down to the glimmering water’s edge, and views of Longs Peak and Keyboard of the Winds. Where the trail falls short on solitude it makes up with stunning views. To get to Mills Lake, park at the Glacier Gorge Trailhead off Bear Lake Road (accessed from the park’s Beaver Meadows entrance). You can also park at Bear Lake and hike down to the trailhead. Both spots fill by 8 am, so if you’re later than that, take the free shuttle from the park-and-ride across from Glacier Basin Campground. 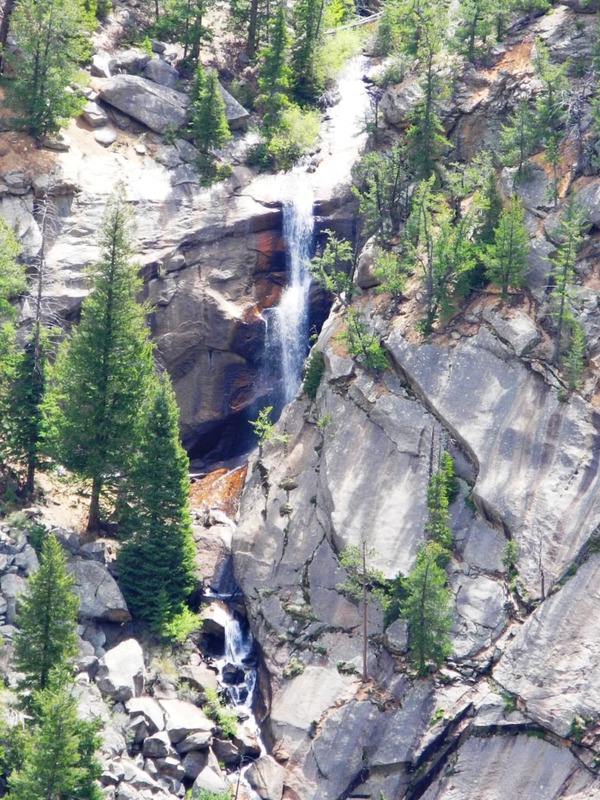 From the trailhead, head toward Alberta Falls, a stunning 30-foot tumbler that begs a picture or two. From here continue up the trail and turn left at the junction of Mills Lake and The Loch and continue to the lake. If your legs aren’t tapped, tack on some mileage by continuing past Mills Lake to Ribbon Falls and Black Lake. Or hit the Loch Vale Trail on the way back to climb up to more lakes and falls.